Migrant Service Workers provide career services to agricultural workers and provide employment and recruitment services for employers. For more information, contact your local Michigan Works! Service Center by calling 1-800-MIWORKS. Assist in locating workers using the Agricultural Recruitment System (ARS) within the state, as well as other states. Direct referral of migrant and seasonal farm workers. Attend Job Fairs and accept applications for the employer. Create effective job descriptions to attract qualified talent. Farm Labor Contractor registrations information. Labor law information pertaining to work hours, wages, and employment of minors. ARS - What is it? The Wagner-Peyser Act requires that the United States Employment Service maintain a system for the orderly movement of workers within and between States. Through the ARS, the State Workforce Agencies can systematically recruit and refer qualified workers from within a State and from other States when there is an anticipated shortage of workers. What requirements does ARS place on employers? Wages: Workers must be paid the prevailing wage among similar employed workers. Housing: Free or public housing must be provided to migrant workers and their families, if applicable, during the employment period. Health and Safety: Federal and state workplace standards must be met for health, safety, wages and working conditions. How does the ARS work? The Agricultural Recruitment System links employers who have temporary agricultural and food processing jobs with workers who need these jobs and are willing to live temporarily away from the local area. An employer asks the local Michigan Works! One Stop Center for help in recruiting temporary agricultural or food processing workers. Contact a Migrant Service Worker at least 30 to 45 days before the date of need to begin the recruitment process. An Agricultural Clearance Order is completed and signed by the employer. Number of workers needed and anticipated date of need. Draft job duties, responsibilities, and work rules. If providing housing, file for license from the Michigan Department of Agriculture and Rural Development. The local Michigan Works! One-Stop Center finds that there is or will be a shortage of qualified and interested workers in the area near the job site. The clearance order is sent to job centers in states where qualified and interested workers are available. The local job center representatives actively recruit for qualified and interested workers. A complete copy of the order and explanation of contract requirements are explained to interested workers. If workers agree to accept the terms of the contract, an interview is coordinated through the local Michigan Works! One-Stop Center. When work begins. The worker is entitled to protection under Federal and state laws relating to wages, working conditions, housing, health and safety. The worker who fulfills the employment contract is eligible for all rights and benefits specified in the Clearance Order. Contact a Migrant Service Worker for assistance with the ARS Process. Contact the Migrant Services Worker for your area to assist with employment and recruitment services. Helping Michigan employers fill jobs while protecting U.S. and foreign workers. 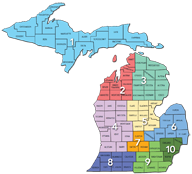 Did you know there are about 10 million acres of farmland in Michigan and the state is home to 52,194 farms?